In a study of adolescent mice with a version of a gene linked to serious human mental illnesses, Johns Hopkins Medicine researchers say they have uncovered a possible explanation for how marijuana may damage the brains of some human teens. In a report that will be published in a 2019 print issue of the journal Biological Psychiatry, the researchers say they showed that pot exposure increases inflammation in a specific type of brain cell in adolescent mice that carries a rare genetic mutation linked to schizophrenia, bipolar disorder and other major psychiatric disorders. In a proof-of-concept experiment, the investigators then used a nonsteroidal anti-inflammatory drug, NS398, to suppress the pot-induced inflammation in the brain. The researchers report they were able to prevent marijuana’s brain damage in mice that appear genetically susceptible to the harmful effects. “The inflammation we saw in our mice is probably activated in many people who smoke marijuana, but our results may help explain why and how some mice—and some people—are genetically predisposed to experience an enhanced inflammatory response and brain damage,” says Mikhail “Misha” Pletnikov, M.D., Ph.D, professor of psychiatry and behavioral sciences at the Johns Hopkins University School of Medicine. Although far more research must be done to determine if their findings apply to humans, Pletnikov says, it’s already clear that heavy cannabis use is linked to long-lasting cognitive problems, but only in a percentage of those who used pot during adolescence. The challenge for scientists has been to identify the risk factors that may increase adverse effects of cannabis. Having that information, Pletnikov says, could lead to efficient preventive strategies. Building on the knowledge that only a select population of teen pot smokers have later cognitive problems, the researchers chose to experiment with a mouse model for psychiatric illnesses that carries a mutation in the DISC1 gene originally found in a Scottish family with many members diagnosed with schizophrenia, bipolar disorder and major depression. The researchers used mice that make the faulty DISC1 protein in their brains. When the mice were about 30 days old, the rodent equivalent of teenagers, the researchers injected them with 8 milligrams per kilogram D9-tetrahydrocannabinol (THC)—the active chemical in marijuana responsible for feeling high—every day for three weeks, somewhat mimicking the exposure from daily smoking during adolescence. Then the researchers stopped the THC exposure for three weeks before testing the mice for behavioral and cognitive deficits. “Essentially, we let them have their fun as teenagers and then let enough time elapse to their young adulthood, or in human terms the time when people reach their late 20s, are living an adult life and may begin to notice cognitive problems,” says Pletnikov. Mice like to explore previously unvisited places or new objects, but examine familiar places or objects much less, suggesting mice have recognition memory. For this reason, researchers often use the Y maze test or the novel object recognition test to evaluate recognition memory in mice. In the Y maze test, a maze shaped like a letter “Y,” mice were initially exposed to two open arms and one blocked arm. Later, when the previously blocked arm became accessible, control mice spent more time in the previously blocked arm compared with the previously visited arms. In the novel object recognition test, mice were initially presented with two identical objects; later, one of the objects was replaced with a new one. Control mice spent much more time exploring the new object compared with the familiar one. In both tests, control mice showed good recognition memory. In contrast, male DISC1 mice exposed to THC showed deficient recognition memory as they explored the previously blocked arm of the Y maze and the new object as much as they examined the familiar arms and objects. The researchers say this indicates poorer recognition memory in the DISC1 mice exposed to marijuana. The effects of THC on recognition memory in the female DISC1 mice were less profound than in male DISC1 mice, so the researchers chose to focus on the male mice for remaining experiments. “In people, women appear to have more persistent cognitive effects from smoking marijuana in their teens than do men, and this is a difference we can’t explain at this time,” says Pletnikov. 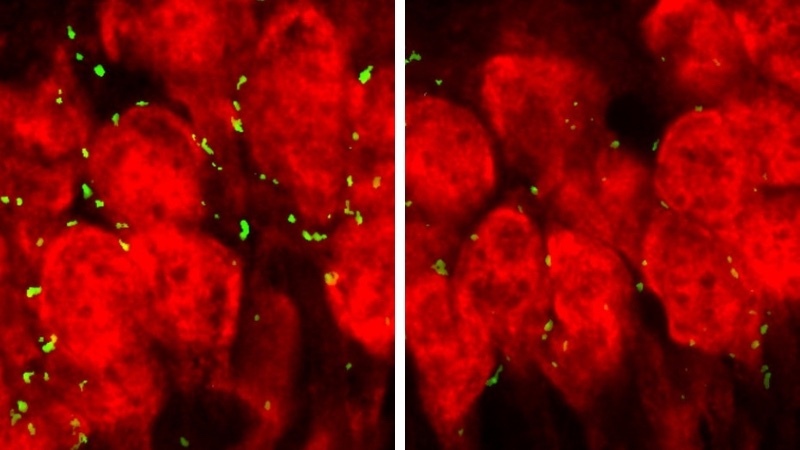 To find out what particular brain cells might be more responsible for mediating damage from THC, the researchers then genetically engineered their mice so that the mutant DISC1 was turned on only in neurons that send electrical responses and encode memory, or only in astrocytes, the “helper” brain cells that provide support and protection to the neurons. They then exposed both groups of mice to THC in their adolescence as before (three weeks straight, then off for three weeks) and again performed the same tests for recognition memory. They found that only when the mutant DISC1 was turned on in astrocytes did the mice have cognitive problems. Then, to see what the faulty DISC1 did in these astrocytes to worsen the pot-induced cognitive problems, the researchers looked at which genes became more or less active in the brain of the mice with mutant DISC1 after exposure to THC compared with the DISC1 mice without THC exposure or control mice exposed to THC. They identified 56 genes related to inflammation that were specifically turned on in the brain of mutant DISC1 mice exposed to THC. To see if tamping down brain inflammation could prevent the memory problems in the DISC1 mutant mice exposed to THC, the researchers used an anti-inflammatory medication. Adolescent mutant DISC1 mice were given the anti-inflammatory medication NS398 30 minutes before their daily injections with THC. When the mice were older and tested, they didn’t have memory problems in the cognitive tests, Pletnikov says. “If our results turn out to be applicable to people, they suggest we could develop safer anti-inflammatory treatments to prevent long-term consequences of marijuana use,” says Pletnikov. Kamiya adds that being able to identify those who are susceptible and preventing them from partaking in marijuana use is another option for protecting teens’ memory. As for future work, Pletnikov’s and Kamiya’s laboratories are collaborating to expand these studies with other animal models to determine how various genetic vulnerabilities may play a role in marijuana’s effects on the developing brain. Additional authors on the study included Yan Jouroukhin, Xiaolei Zhu, Alexey Shevelkin, Yuto Hasegawa, Bagrat Abazyan, Atsushi Saito and Jonathan Pevsner of Johns Hopkins. The study was supported by grants from the National Institute on Drug Abuse (DA041208), the National Institute on Mental Health Conte Center (MH-094268, MH-083728) and the Brain and Behavior Research Foundation. COI: Authors declare no conflict of interest.